This simple, 2-ingredient Weight Watchers Friendly slow cooker BBQ chicken recipe could NOT be easier. A variation of my favorite 2-ingredient salsa chicken, it is one of my go-to recipes perfect for busy days. And the first quick and easy meal that got tossed into the crock pot after arriving at the cabin this summer. Perfect for pot lucks, picnics and game day get togethers too. Be sure to use your favorite barbecue sauce (affiliate link). The chicken will release plenty of juice during cooking, which will dilute the flavors a bit. While I chose boneless, skinless chicken thighs, go with whatever part of the chicken you prefer – drumsticks, legs and breasts all will work. I like to serve this chicken with baked potatoes, peas and coleslaw. 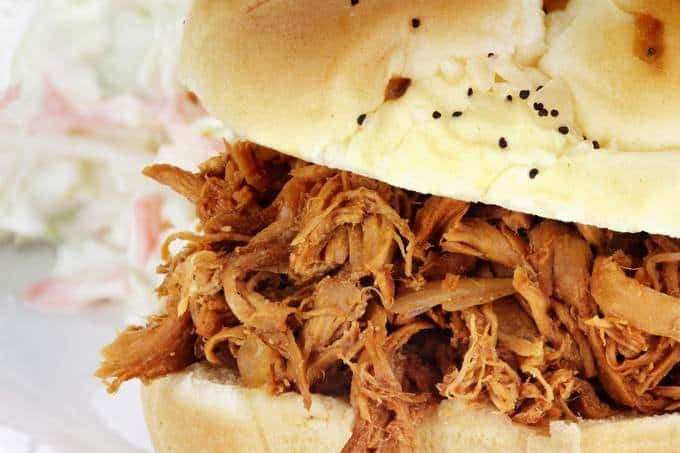 It’s also yummy shredded and turned into “pulled chicken” that can be used to top a baked potato, in a rice bowl or as a sandwich filling. This recipe makes 6 servings. And it’s easy to double when feeding a crowd or portion out and freeze for future quick and easy meals. According to my calculations, each serving has about 200 calories and *6 Weight Watchers SmartPoints. Enjoy! different BBQ sauce – there are so many choices available today. Look for one that’s low in sugar. 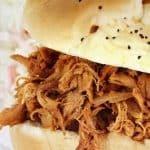 If you’ve made this slow cooker barbecue chicken, please give the recipe a star rating below and leave a comment letting me know how you liked it. This is one of the EASIEST slow cooker recipe EVER! Just TWO ingredients: BBQ sauce and chicken makes delicious juicy chicken that can be used in a variety of ways. Place the chicken in your slow cooker. Top with the barbecue sauce. Cover and cook on LOW until the chicken is tender, 4 to 6 hours. When cooked, remove the chicken and set on a large plate or cutting board and cut into chunks or shred with 2 forks to make "pulled chicken." Add the chicken back into the crock pot with the pots juices. Season to taste with salt and pepper. WW points may be less if lower sugar barbecue sauce is used. Do you know what the FreeStyle SP’s would drop down to if I used only the chicken breasts for this? Thank you! If you used Chicken Breasts you would only need to count the Points for your BBQ sauce because chicken breasts are zero points on Freestyle.